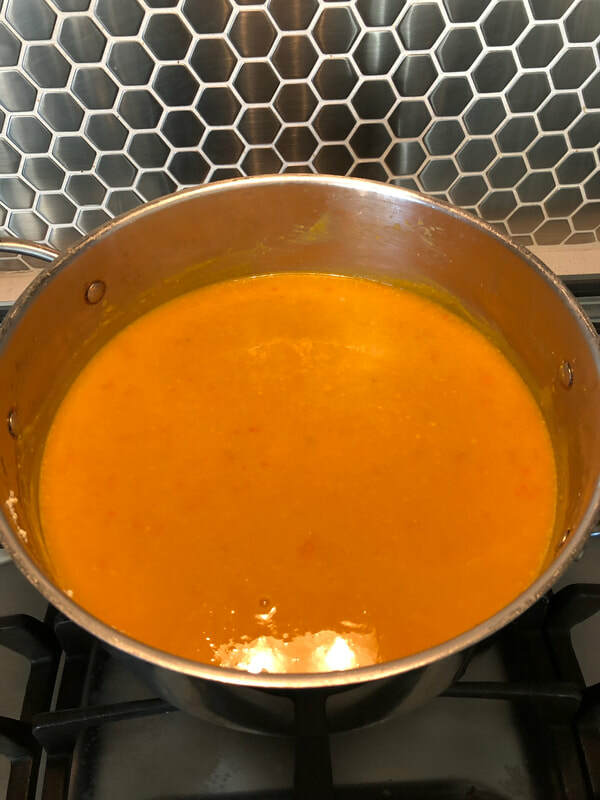 The original WaPo recipe calls for a very specific red kuri squash, but kabocha, which is widely available in CA and HI works just fine, and butternut squash in an absolute pinch. I have found red kuri squash pretty consistently at Whole Foods, but only in the fall. Kabocha and butternut seem to be year-round kinds of squashes. Kuri squash makes is the prettiest color and has a stronger kuri (chestnut) flavor, but kabocha works just fine too. See the below pics for comparison. This is a dump and go soup, and you just have to make sure the pot doesn’t boil over. You will also need a hand blender. Cut and seed the red kuri squash into large bite-sized pieces. You absolutely don’t have to be precise. IMPORTANT NOTE: If you use a butternut squash, you MUST to peel it. Slice the red onion any way you want it. You will blend at the end, so it doesn't really matter. Peel, core and cut the apple into chunks. Again precision is not important. ​of everything. Reduce heat to low and cook until the squash is very tender. Use the hand blender to make everything smooth. It will take awhile, but will be well-worth it. Season to taste with salt and pepper. Add whatever mix-ins you want. Plays well with Kuri Sausage Sourdough Stuffing or Cornbread Stuffing acting as croutons​.